This ticket stub, rescued from a scrapbook, gives us a look into the penultimate day of the Brewers' penultimate season in Milwaukee. 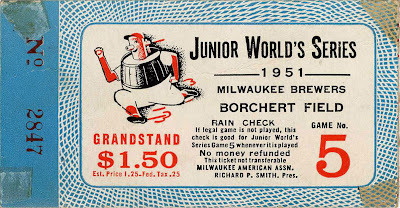 This ticket was good for one Borchert Field grandstand entry to the Junior World's Series game against the Montreal Royals. 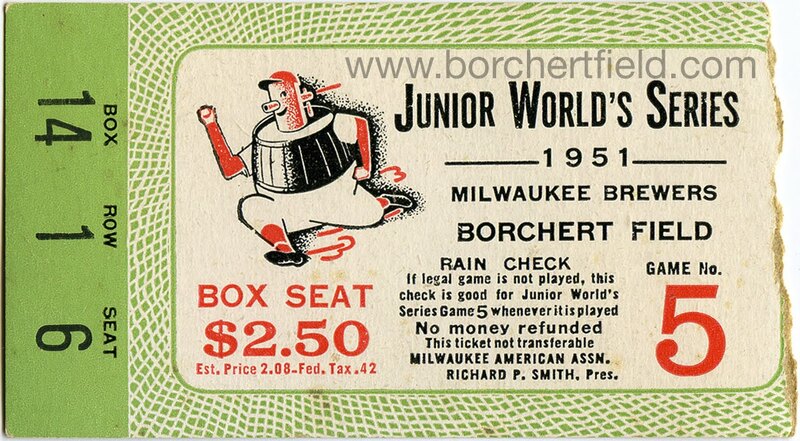 The Junior World's Series, also known as the Little World Series (the possessive forms of both names seem to have been used interchangeably), was a best-of-seven played between representatives of two of the largest minor leagues, the American Association and the International League. Unlike the leagues involved in that other World Series, the American Association didn't automatically send its pennant winner. The champion instead joined the next three teams in a two-round "Shaughnessy playoff" to determine who would go on to the Little Series. In the 1940s, it was a source of great consternation for team president Bill Veeck that his mighty clubs, which took home three pennants in a row, couldn't ever make it to the Series. 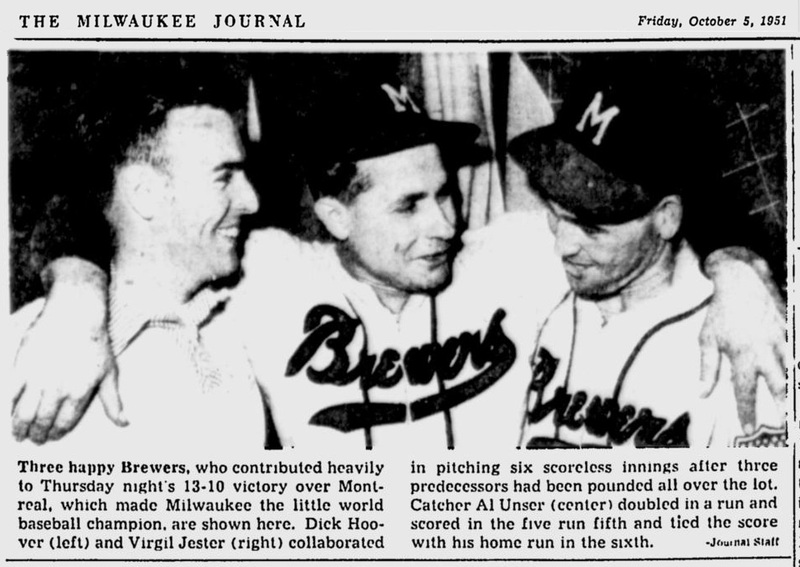 In 1951, however, the Brewers were both the Association champs and the playoff kings for just the second time in their history. The Series had opened in Montreal, and by the time the Brewers came back to the Orchard they found themselves down 2-1. A little home cooking was just what the Brews needed, though, and they came back to take the fourth game and tie the series. That's where it stood when this ticket was carried through the turnstyle. Game 5 was played on October 3rd at Borchert Field. The Brewers rewarded the home fans from the start, scoring on a hard single from first baseman and Rookie of the Year George Crowe in the bottom of the first. They scored another in the third and four in the seventh to put the game away, all while pitcher Ernie Johnson held the Royals scoreless. It was never close, and when the out was recorded the score was six to nothing in Milwaukee's favor. This game broke the series tie and put the Brewers just one game away from clinching. The following day, the two clubs returned to Eighth and Chambers to play again. That sixth game didn't start off well for the home team, as the Royals jumped out to a 10-2 lead in the top of the third inning. The Brews wouldn't be stopped, though; they battled back with five runs in the sixth, one in the seventh and three in the eighth. When the dust settled, it was Brewers 13, Royals 10. Game over, series over and Milwaukee was on top of the minor league baseball world. This was the club's eighth AA pennant, third Little Series championship and fifth overall minor league crown. The ticket stub itself is a fascinating artifact from the last days of the American Association Brewers. I love that moiré pattern, not to mention any opportunity to see Owgust in action. 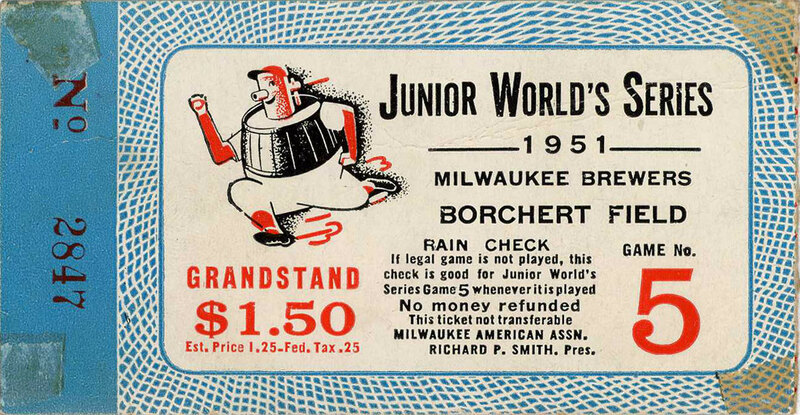 And compare this ticket with the box set ticket; $2.50 got you into the box seats, but you only needed $1.50 for the grandstand. Regardless of where you were sitting, grandstand or box, if you were one of the 9,188 people with a ticket like this, it must have been one hell of a game to watch.